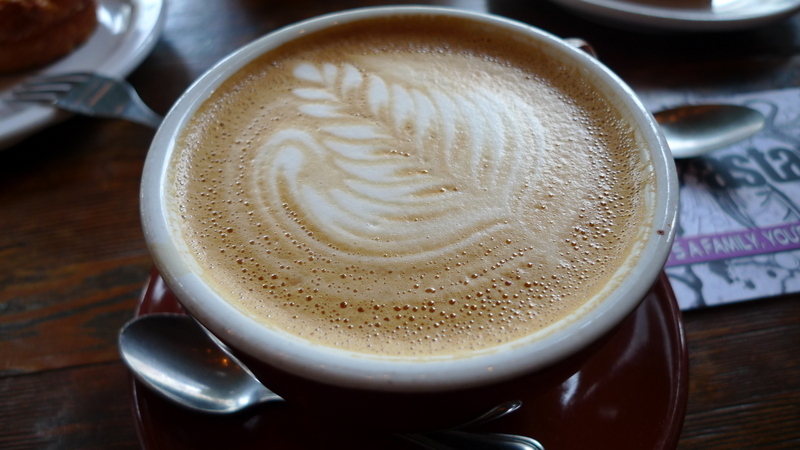 Located in the Mission District (Valencia Street between 14th and 15th), Four Barrel Coffee is a place that takes its artisanal coffee to a level of seriousness that you might expect from a master sommelier. Their attention to detail, bordering on the obsessive, would be ripe for parody if the results weren’t so impressive. The coffee is amazing, the pastries are fantastic, and the atmosphere is communal in the best sense of the word. The space is a large warehouse. From the front, you could breeze by (as I almost did) without realizing that there is a coffee house inside. 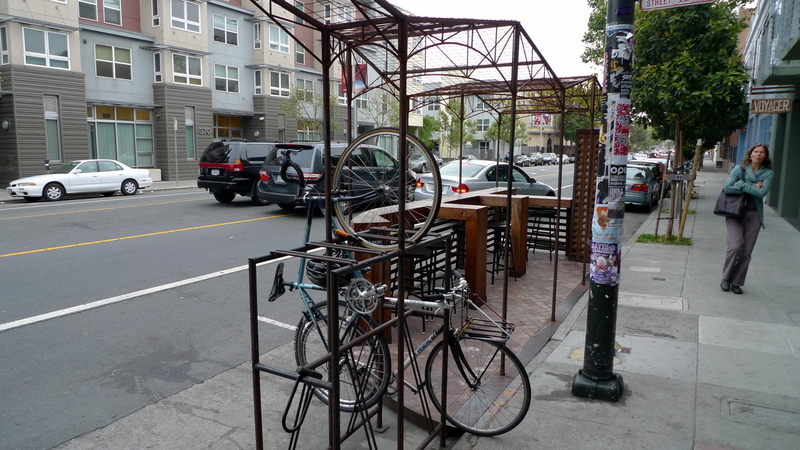 If in doubt, look for the funky bicycle racks and outdoor seating (above). Immediately on your left as you walk in is a pour-over coffee bar. This “next thing” in coffee is all about the slow brew of coffee through a cone shape filter. Sound familiar? Yes, that’s the way most home coffee machines brew coffee. It seems, though, that you can get really particular about the details. Anyhow, the person working at the bar can also answer questions about their coffees (sourced from micro-regions all over the world and brewed at the back of the shop) and other coffee making paraphernalia. In fact, one lady spent twenty minutes demonstrating the various Japanese made ceramic coffee grinders to me. The counter and espresso machines are in the center of the room. The baristas have their own personality and flair, demonstrating a level of artistry that your average Starbucks barista will not. Of course, your average Starbucks barista is also now using a fully automated machine that requires no more skill to use than the average coffee vending machine minus the coins. 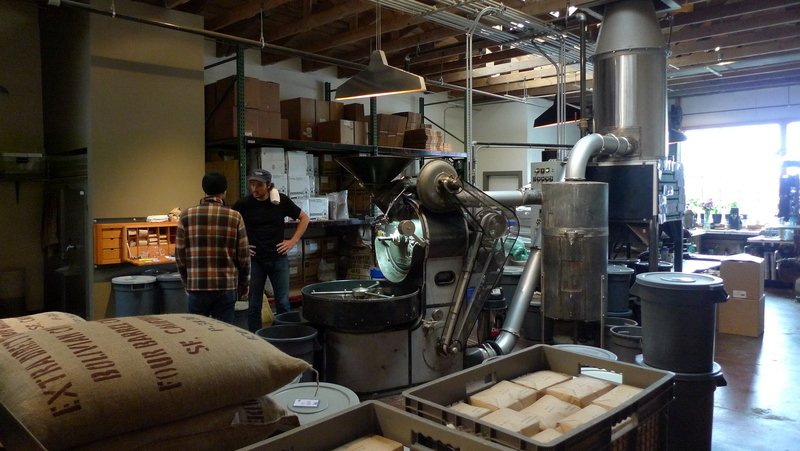 The coffee roasting takes place in the back half of the warehouse. You can sit at a counter watching the action take place and it gives the space an especially industrial feel, which may explain what attracts the huge number of hipsters. Besides the coffee, Four Barrel offers really amazing pastries, sources from three different bakeries. 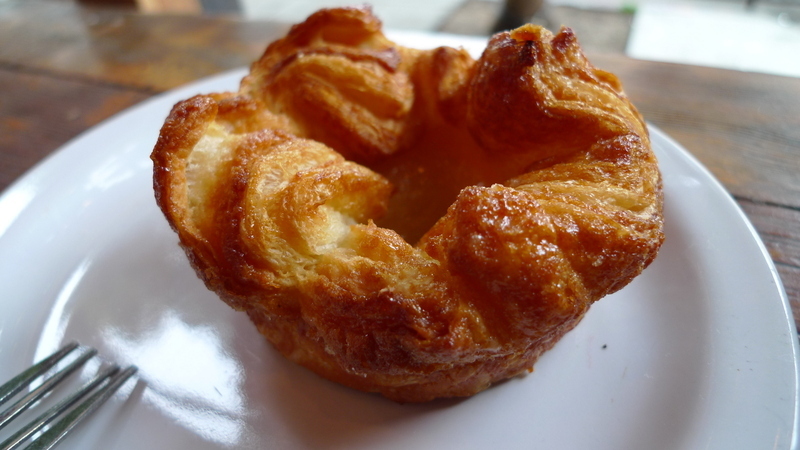 One that caught my heart (and caused me to make two return trips) was the kouign amann, a butter pastry from Brittany that seems to be the new cupcake on the west coast. These are provided by Starter Bakery in Oakland. Layers of buttery, sugary goodness that caramelize as they bake. You are not allowed to think about diets while you eat this. Just don’t. 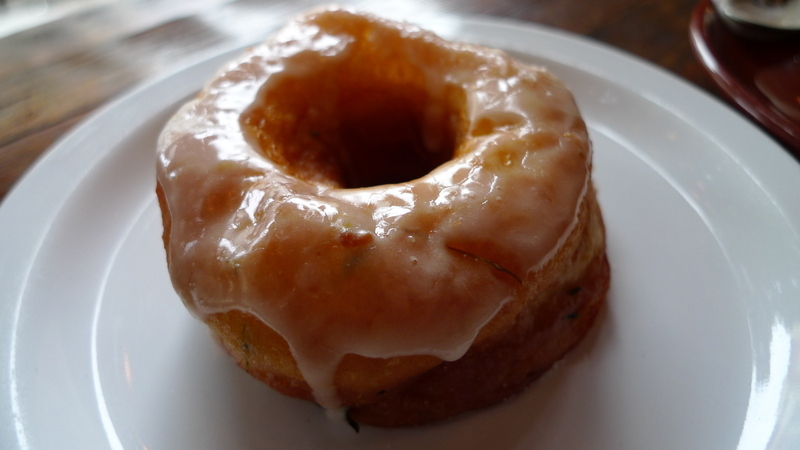 Another wonderful treat (not sure what bakery it was from but possibly Dynamo Donuts on 24th Street) was a lemon-thyme donut. I’m not generally a huge donut fan, but this was a spectacularly light, pleasant, and surprising donut. The lemon-thyme flavor is refreshing and much more complex than you might expect. And then there is the coffee. 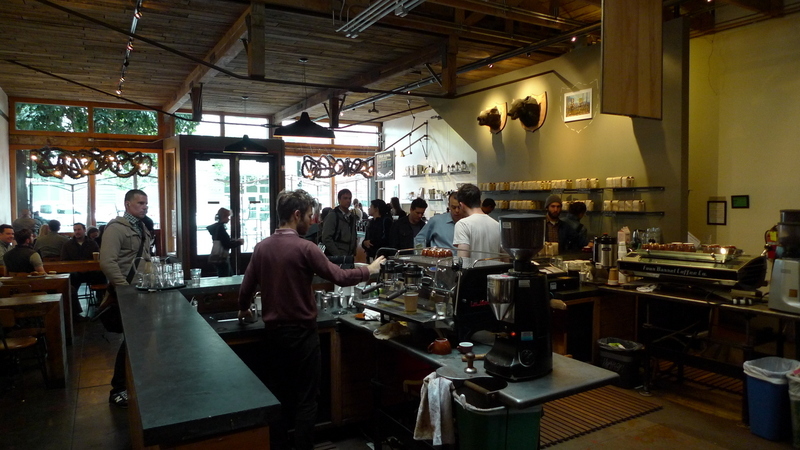 You can order any of Four Barrel’s single-origin coffees as an espresso. Not sure what the default espresso is, but I found it nicely balanced, not too acidic, and just what I needed to start the day. 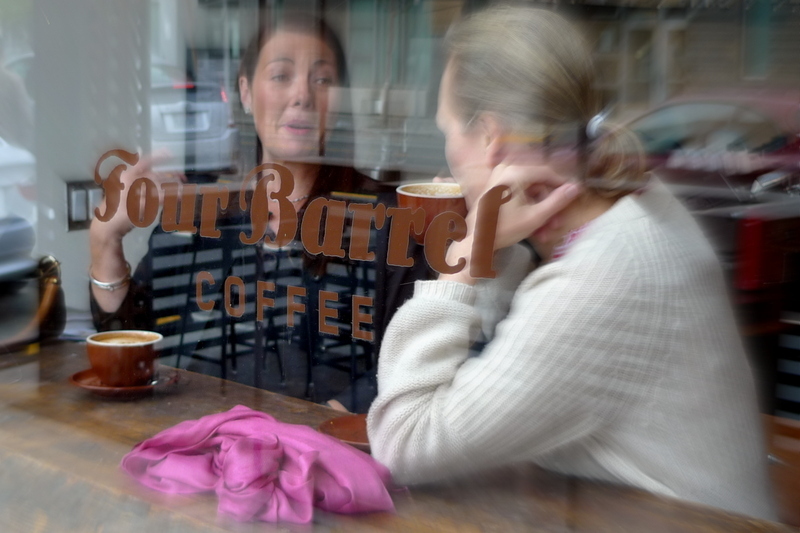 This entry was posted in Uncategorized and tagged amann, Barrel, Coffee, Espresso, food, Four, FourBarrel, kouign, KouignAmann, Mission, Restaurant, sanfrancisco, shop by christao408. Bookmark the permalink. just the type of place i would love to hang out at. lovin’ those coffee and pastries. I would love to discuss the meaning of life over their coffee and pastries!!! I love the smell of coffee but have never developed a taste for it! This looks like an interesting spot – even if you don’t like coffee! So much to learn and the pastry is very pretty (and I’m sure it is tasty). 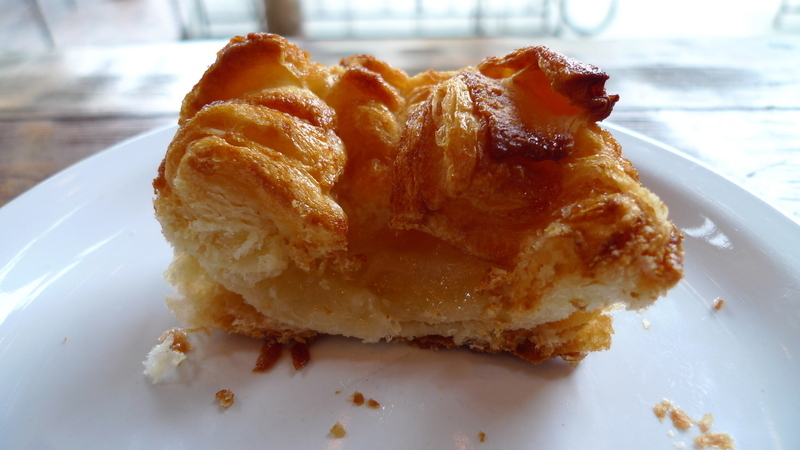 @murisopsis – I really want to try making that kouign amann. The recipe indicates that it is similar to how croissants are made, which doesn’t seem impossible. @Fatcat723 – Perhaps the meaning of life *is* coffee and pastries! @rudyhou – Other than the chairs being a bit hard, it was a nice place to hang out. There is an Australian outfit with a branch here in Sillypore that has a similar atmosphere/concept. Unfortunately, their attention to detail is nonexistent, bordering on the indolent. There is something to be said for living in a large city. We had coffee almost every weekend, visiting coffee places here in LA is a joy! Ever since my coffee press broke, I’ve been drinking instant coffee. *gasp* I should look for another one. I love places like these. Oh my lordy…. that food looks amazing… and though I was unfortunate and born without taste buds for coffee… I can definitely appreciated the design of the shop and the overall feel of it. Will definitely have to visit it someday. @stepaside_loser – No, it’s called “Toby’s Estate” if I am not mistaken. I would love to go there, and not being a coffee drinker (or tea either), I will get myself a cuppa. Now I just have to move out of this place and get going somewhere. @yang1815 – No more expensive than anything else in San Francisco. (That statement cuts both ways, right? )@ZSA_MD – Cuppa what? Water? =D@beowulf222 – That’s kind of a pretentious name… @bengozen – Interesting to me that some people don’t care for coffee. I used to be that way but developed an appreciation for it. But if you aren’t a coffee person, just eat the pastries and have a hot chocolate or a tea. I think they have tea. Maybe. @stepaside_loser – Gloria Jeans – blech! @stepaside_loser – Thanks, I really like that photo, too. Not sure how the ladies feel about being plastered on the internet, but if you don’t want to be seen, don’t sit in a window seat. @ElusiveWords – AIEEE!!! Instant coffee?! Quick, we’re starting a collection to buy you a new coffee maker. @vsan79 – Sorry to make you homesick for the US. I remember what it is like to leave the US and think back to different things you miss about it. @Inciteful – True, true… and many things to be said against it, as well. @CurryPuffy – Yeah, very similiar culture between the two cities even if their inhabitants won’t admit the similarities.